Fire is important to the world-renown forest diversity of the Klamath-Siskiyou and is recognized as the keystone ecological process. Here in the KS, forests with fire are healthy forests! Diversity follows fire, because fire is dynamic. 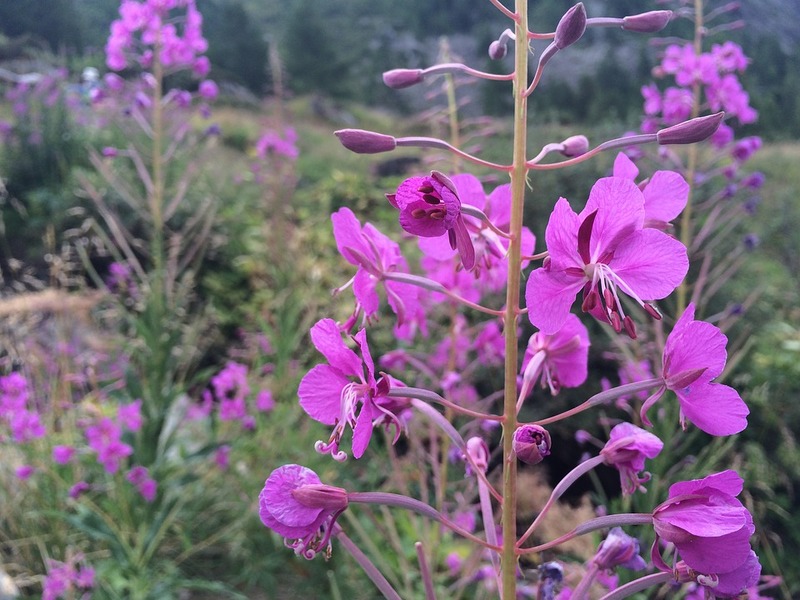 Fireweed, Epilobium angustifolium relies on fire, and grows vigorously in the several years following a burn. When fires burn across the landscape, they vary greatly with the terrain. Fires wash through forested lands like many other weather processes, greatly affecting some areas, and some barely at all. A decade and a half after the 2002 Biscuit fire, in the Kalmiopsis region there are many pockets of old lush forest thriving on north or east facing slopes and in drainages covered by ferns, mosses, shrubs, the rare Port Orford Cedar, and fungi. Some places have benefitted from moderate burns on open slopes and basins, where rejuvenation is seen in new Cobra lily wetlands and young conifer stands. Other places that characteristically burn hotter, like dry ridges, have resprouted with fire-loving species like manzanita, knobcone pine, and ceanothus in the years following a burn. Fire opens up space for new life at all levels of the forest structure. Hiking on the Boundary Trail among burned trees and the regrowth of fire-loving shrubs on the Siskiyou Crest, 5 years after the moderate burn in 2012. In the higher reaches of the canopy, fire creates hollowed-out tree cavities for nesting birds and encourages insect life that provides forage for birds and small mammals. The forest canopy and mid-story when cleared by fire, allows for sunlight to enliven the plants growing lower down. This can enable larger trees to flourish and grasses and flowers to sprout. Trees that burn hottest help to create space on the forest floor in the form of fallen trees and ground hollows where roots have burned. These places allow for plants to grow from seeds stored in the soil (known as the seed bank), and mushrooms like morels to bloom from the underground fungal network. Many other species land here to grow on surfaces with little competition - plant seeds and fungal spores blow in with the wind, other seeds are brought by carrier birds and mammals, insects fly and spiders utilize their threads to ‘balloon’ in. Mature trees that survive fire are critically important to healthy forests. The Blackbacked Woodpecker is highly dependant on heavily burned forest habitatsfor tree cavities and abundant insects. Old-growth trees, that have continually grown their bark to be thick and corky, demonstrate fire-resistant adaptations. Many large pines, like Ponderosa or Jeffrey, require at least 100 years to acquire fire-insulating properties that can allow them to survive a moderate intensity burn. Surviving trees create biological legacies by holding back soil nutrients and water, broadcasting new seeds to regrow new trees, and providing shade for seedling growth. Large mature trees that have survived logging have often survived many fires. They continue to support water quality by moderating stream temperatures, preventing soil erosion, and by providing vital salmon spawning habitat. Fire is essential to recycling and redistributing essential nutrients in the forest ecosystem. The flow of nutrients in the forest is “jump started” through heat, ash additions, changes to the microclimate and changed vegetation dynamics allowing for soil restoration and new plant growth. Fire can transform some nutrients into different forms in the soil, helping stimulate the important growth of insect, bacteria, and fungi in the soil as they continue to break down organic matter. Changes in the structure of the forest also affects growth of plants and thus helps to change the absorption and turnover of nutrients - especially stimulating new nitrogen-fixing plants that are essential for building the soil and ‘paving the way’ for other plant growth. The importance of soil health is a critical foundation for forest health. Scientists have established some principles to describe the relationship of fire and nutrient cycling, but effects are specific to a local area and should be studied closely. Today’s forest fires provide a great opportunity to study these effects at a finer scale. Fire unifies life and death to create a sustainable forest existence. There is so much to learn about fires and forests of western North America. Deeper understanding of fire enables us to see that our forests are reborn by fire. A photo taken ofthe Kalmiopsis rim, on the edge of the Wilderness area, just weeks after the 2017 Chetco Bar fire burned. This fire rapidly grew due to wind patterns and spread toward the coast, yet only 7% of the total burn area was described as severe. Fires burned on steep slopes in the Klamath National Forest during the summer of 2014. 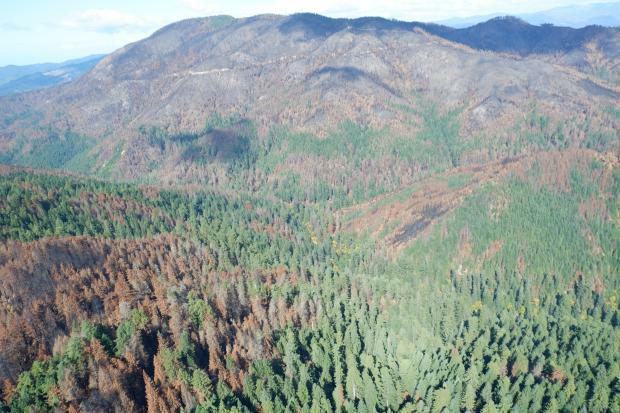 Pictured here is some of the resulting green and blackened trees just months after the mixed-severity burn in the Grider Creek drainage; a critical wildlife corridor that the National Forest proposed for heavy logging post-fire. When we consider the makings of a healthy forest in the KS, there is no question that fire is necessary. At this point in history, the most important question remains; how do we adapt our forests, our communities, and policy to be ‘fire-wise’ relative to what we know about climate change. Guided by rigorous science and sustainable community values we must see the forest for the trees: recognizing ecosystems as an interconnected whole. There is an inextricable link between the survival of our forests, and the human species.